For those who know my tastes, you can probably guess: I like Figment Man. Figment Man goes on smelling of murky (almost chalky) lemon mixing with geranium leaf and pepper. As this accord burns off, an acrid smell arises: a mix of more pepper, animal piss, damp earth and water-saturated stucco. In mid-development there's moss, incense and a hint of woods (more pine/cedar/guaiac than sandalwood, to me), and then a medicinal/camphorous aroma comes to the fore before blending with mild musks. No note in Figment Man stands out, or smells like its usual, readily identifiable/predictable self. Figment Man was inspired by Bhutan, which has sparked the creation of other perfumes. In fact, as I wore this fragrance three scents came to mind. If you don't want to pay $300 for just ONE bottle of Figment Man, but get three items to recreate it and stretch your dollars ($360 total), layer lots of Zoologist Bat (100 ml Eau de Parfum, $135) with a few sprays of Bhutan-ish L'Artisan Parfumeur Dzongkha (100 ml Eau de Toilette, $130) while burning Cire Trudon's Chandernagor candle ($95) — you may also rub some of Chandernagor's oily wax on your wrists like I do. Cool/damp heights, ancient buildings, scented religious offerings and folk medicines (made with the likes of camphor and chrysanthemum) are conjured by Figment Man, certainly experiences you'd get in Bhutan. It's not a perfume that I'd wear every day or even once a week, but for special occasions that call for solemnity and restraint — but still allow for novelty — it's a great choice. Just don't get angry if someone says "I smell mice!" Amouage Figment Man is $300 for 100 ml Eau de Parfum; Amouage, why not pull a Frédéric Malle and make 10 ml bottles of your perfumes? For buying information, see the listing for Amouage under Perfume Houses. * Perfumer Annick Menardo; listed notes of lemon, pink pepper, geranium, sandalwood, animalic accord, vetiver, leather, labdanum, guaiac wood, musk. Note: top image of Paro Taktsang (or Tiger's Nest) via Wikimedia Commons. What is it about a certain scent that makes it “stink” to some people, but be attractive to others? Perception? Scent memory? Kevin likes this scent and saves it for special occasions, but others found the “garbage disposal/sickening/mice smell” foul enough to actually comment out loud. So is it a physical difference in Kevin’s olfactory nerve, or something totally different? Enquiring minds want to know!! As a personal example, I don’t like most oud or tuberose notes, but others love both…..
I’ve wondered about this many times. When a vetiver scent smells bitter/sour or patch scent smells moldy/off to me but others love it, does that mean they like the smell of sour/moldy or that they perceive it completely differently from me? Are we smelling different things or do we just prefer different smells? All, tis a mystery! I always believe it’s personal taste, except in the case of aromachemicals one can’t detect…then a scent is different to those who can and can’t smell those missing pieces? I’ve come to the conclusion that, when it comes to the senses of sight and sound, we all see and hear the same things even though we may react differently to them, but in the cases of smell and taste two people may actually experience the same thing in very diverse ways. All five senses are not created equal. Or because our vocabulary to describe smell and taste is less developed, and they can’t be reproduced remotely, it’s easier to suspect that we’re experiencing different things? Taste in eg home decor can be radically different between people: say you like Farrow and Ball shades of country house grey and someone else likes fake leopard and mirror balls. You could mutually find that peculiar but you wouldn’t assume they were physically seeing their glitter as matt and grey, just that they like sparkly stuff. And the whole sum of life experiences will go towards preferences in smell as well as other things. I think there are both objective and subjective factors. Not all noses are the same – different individuals can detect the same notes at different concentrations, some noses are hyper-sensitive to some notes, others oblivious. That differing information is then interpreted subjectively by the brain in the light of previous exposure to the smell and those associations, so even if equal actual smell information reaches the brain, you may get a totally different response from two people. That’s before you even get to the massive effect skin chemistry has on fragrances notes, making sour on one person, roses on another. I agree, there is both a physical factor and a perception factor. It sounds like an “anti-IFRA” scent but the name makes it seem a pro-IFRA one! Now I have new things to do with my Dzongkha and Bat! Just tried! Lots of bitter dampness! 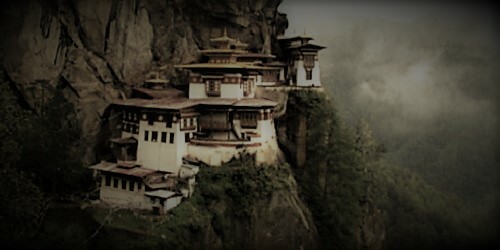 I have been to Bhutan. It smells of smoke from early morning wood fires, and tea leaves and damp when you are higher than the clouds. Also, yak butter burning in candles. Sikkim smells much the same, but I have never found a fragrance that resembles the pureness and sweetness of the Himalayan air. Apsara…you need better than ozone to come close to that ‘air’ aroma! And lucky you…seeing Bhutan. So very lucky to have traveled there, yes. Beautiful! I have a memory of visiting Kenya back in the day and the smells from out in the bush. There is no replicating the experience really, but it’s fun to see what comes close. Well this sounds like my cup of tea!Will try out asap! I really have to try this now, just out of contractarian curiosity! Just read a review of Brakken Woman that describes something entirely different from what I smell – soapy toilet bowl cleaner? I wish my toilet smelled like this! – but I also like it when something smells weird and it’s just a love it or hate it thing. Amy, me, too. Anything different in these homogeneous days! I would be really hurt if a perfume I was wearing induced people to say the things they said when u were wearing Figment. I think I would cry, even! Comments like those would put me off from ever wearing it again. So, from one perfumisto to another, how do we get over that, Kev? Should we just ne brace and not give a stuff what other people think? I like Absolue Pour Le Soir but have never worn it out in public. The average person just would not understand APlS. I agree to be brave! I am often appalled by the overwhelming perfume smells coming from people I encounter in public and would love to be hit with something really unusual rather than just the latest celebrity fragrance seemingly sprayed from a hose! I completely understand restraint in the office, but I say take APlS to the mall, the grocery store…! Thanks for that! Now feeling inspired! Be brave! You can always strat quiet with one spray, and you may find the average person does not even notice it on you. Even if they do, I’ve lost count of the number of times I have been gassed by other people walking past me. Having seen someone fumigate themselves with over a dozen sprays all over themself at the Chanel counter on more than one occasion (scenting up for the weekend? ), I’m only surprised that other shoppers don’t pass out altogether. Start quietly? I didn’t think to do that, but is good advice. Ta! Kev: do sign up for my Perfumista Boot Camp trainings! HA! When people are rude, like those commenting on scent in the “air” without thinking, I love to say: “That’s my perfume.” Leave it at that. Love to see ’em fumble, stumble, even grumble on occasion. I have a tough skin I guess. I could care less who likes or dislikes what I wear scentwise. You’ve inspired me to write a post on this very topice…stay tuned! Looking forward to this post! After all, I deal with an office Perrfume Grinch! I absolutely try to be respectful of his nose and opinion (mutual respect is the only way for coworkers to get along on occasion), but I would love to be braver in other situations….. I disliked both the men’s and women’s Figment scents, much too earthy with other really off-putting notes. The women’s one was a scrubber, which is a shame as the bottle is gorgeous. cazaubon: I’m with you…I wish all the Amouage scents came in the women’s bottles. I need to smell the Figment Woman scent…. Usually I like the women’s perfumes in the line more than the men’s.